Q: Why do you use CO2? Why not ordinary compressed air? A: During the early days of our rocket work we used a bicycle pump to fill our motors with air. This worked fine for operating pressures approaching 100 psi. When we started experimenting with the deep-drawn steel cans, which could hold much higher pressures, the bicycle pump was not able to supply the pressure. It was a lot of work at 100 psi, but 3-400 psi was not possible. The pump was incapable of producing those pressures. So we had to find an alternative. CO2 has a vapor pressure of ~800 psi at room temperature, and is available in small cylinders at the sporting-goods store. 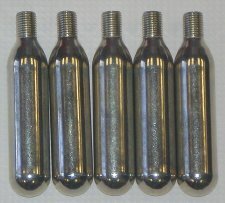 They are used commonly in BB & pellet guns. A nice unit for filling bicycle tires is also available. The only limitation to this approach is the small volume of gas available in the cylinders. We would sometimes have to use two or three cylinders to fill the rocket to the desired operating pressure. Now that we are using plastic soda bottles for our rocket motors a bicycle pump is the best approach. With a well-made launcher that doesn't leak and bicycle pump it's easy to reach the operating pressures required. Keeping the volume of your launcher tubing, etc., as small as possible also makes filling with a pump much easier.